Don’t Give Up, Find Hope! What a beautiful and faithful God we have! Yes I know that sounds a bit profound, but as I’ve been reading the Bible from the beginning, I feel like I’m meeting God for the first time. He is so so faithful, even when we are so not! And moment after broken and unfaithful moment of my own I began to realize how I am no different than them. It is just too easy to take for granted the incredible miracles He puts in our lives. But God loved the Israelites so much He wasn’t willing to give up on them. And He loves us so much that He’s not going to give up on us either. 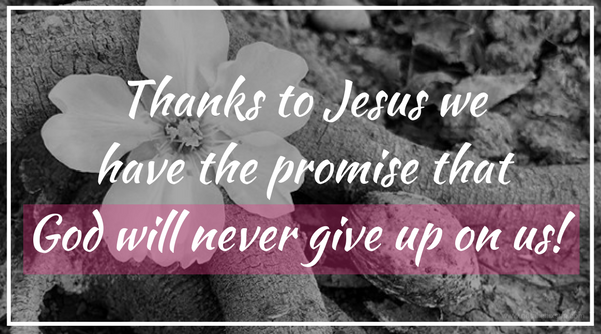 Thanks to Jesus we have the promise that God will never give up on us! My soul aches to be with our Lord and Savior. I long to be overcome by His presence and be face to face with Him! 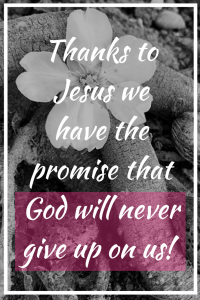 Just as the Israelites enjoyed the fulfillment and peace of their inheritance in the book of Joshua, I am thankful we can experience God’s promised gift of Jesus Christ in our hearts, and we can partake in His peace now! We have the guarantee that because of Jesus you and I are entirely worthy, accepted and loved. Now, yesterday and for eternity! Don’t give up when you feel down, frustrated or troubled. Find hope and peace that you are His!! Take peace in His love and light so you can share it with others! Need prayer? Share your prayer requests and praises with me in the comments below. I will personally read, pray and reply. Get daily words and moments by following me on Instagram and Facebook! Click the button below to grab my FREE Simple 3-Step Morning Routine!